What part did you play in the choice of theatre for the production? I didn’t have too much involvement at all really, and have consciously stayed out of the way. I did visit a few theatres, and was a bit dismayed – as I am when I’m in the audience – by the big dress circles, which create two problems. Firstly, they bugger up the view for the people in the back of the stalls. And secondly, (and for me, vitally) the sound mix position which is generally right at the back of the stalls is completely hopeless. So when I found out that the Cambridge was a possibility, I was thrilled, because it has a huge upper dress, but a very shallow dress-circle, which means everyone gets a good view of Rob Howell’s amazing set design, and the sound guy can hear what’s going on in the room. I also love Art Deco architecture, I love Seven Dials, and I like the odd, winding foyers spaces that can be decorated Matilda style. How much preparation have you been involved in for the West End move? Not much really. I’ve had no involvement in casting. Every now and then Matthew [Warchus] or Chris [Nightingale] ring me up from the rehearsal room and suggest a tiny trim or ask for a little addition. But I’ve only been in to have a look once. I’m not really needed, I have heaps of other stuff to do, and I’m really keen to watch the show on opening preview without knowing all the details of what they’re doing. I’m going to get some of the magic that the audience gets! You tweeted about trying out an electric piano for the pit. Did you find one? Oh yeah. I was insistent on a real piano at the RSC [Courtyard Theatre], because my score was pretty piano heavy, and I wanted the depth of tone and dynamic range that only an acoustic instrument can provide. But the band in the West End are going to be in an acoustically isolated room under the stage, which means all their sound is going to be coming out of the speakers… none from the actually instrument. In this scenario, the advantages of a real piano are lost – in fact it leads to a lot of variables that are annoying – microphone type and position, spill of other instruments into the piano mics, and – most annoyingly – needing a tuner every day. Apart from anything, if the show runs for many months, that’s a significant cost. Anyway, I went into Harrods because Roland have a rep there, and played the new Roland V-piano. It is absolutely incredible – the best digital piano I have ever played. So that’s what we’re going with! BORING, but fun. Are you excited by how it’s all going so far? I’m most enthralled by the the theatre, and have been dropping in a bit to watch progress. Obviously we are incredibly hopeful that the show will run for a significant time, and the extent to which a theatre is transformed before the start of a new show would surprise people I think. They are actually cutting huge support beams and concrete slabs out from under the stage to facilitate our gear. Huge metal frames of coloured letters are already hung, as are the PA front of house speakers and the sliding bars for the set. In the auditorium, the entire upper-dress circle floor has been raised at each step to increase the angle so that people can see the front of our stage, which is being built out a little bit beyond the pros arch. The foyers are all being re-carpeted and repainted by the theatre and then will be decorated by Rob [Howell] to ensure that kids feel hugged by Matilda-ness from the moment they walk into the building. I absolutely love watching this stuff happen. The Original Cast Recording is available from the shop in Stratford-upon-Avon and online from the RSC shop. It will also be available from iTunes, but not until the 18th October 2011, the date of the first preview performance at the Cambridge Theatre in London’s West End. 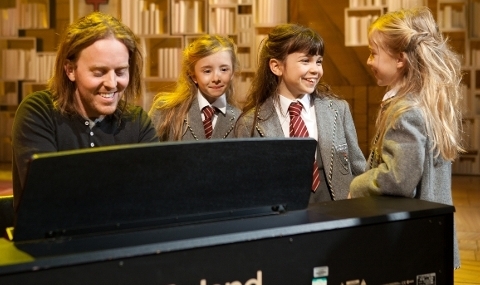 There’s a cracking Matilda The Musical website where you can not only buy tickets to the show and sign up to the RSC mailing list for all the latest news but also listen to preview clips of songs on the cast recording, view the show’s trailer and much much more. The Matilda page on this site will help you catch up on the story so far, look at photos, view videos and read some of the press to date including the many four and five star reviews the show received in Stratford-upon-Avon. It will even link you back to this interview in a freaky little loop if you wish. Great article. Interested in the roland piano stuff – not boring – to me anyway! So exciting to read about the preparations at the theatre. Thank you! Feeling hugged by matilda-ness; Already! !